Valve capacitor microphone with a cardioid polar-pattern. Renowned for it’s high sensitivity, the M 990 possesses a superb dynamic range. The combination of the modern, large diaphragm capsule technology with the classic full-bodied sound of valve microphones, makes it much sought after by vocalists and soloists. 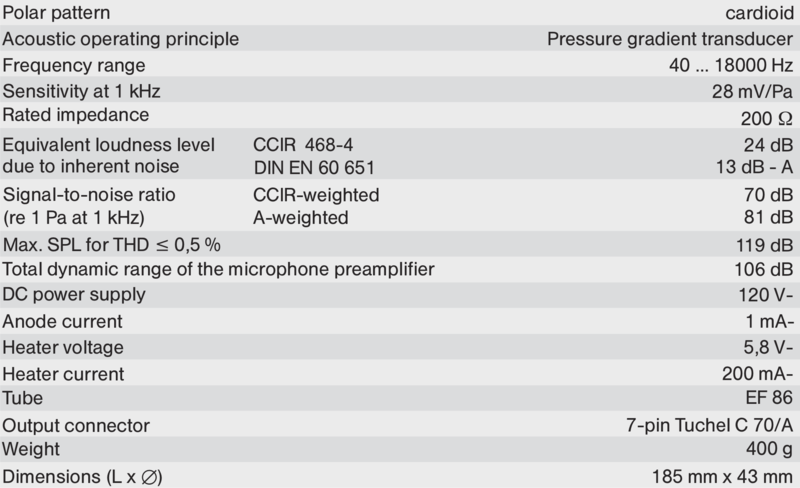 The large diameter pressure-gradient transducer in the M 990 has a sputtered gold plastic diaphragm, and the valve pre-amplifier uses a pentode configured as a triode, selected for its sonic characteristics. The M 990 is renowned for its high sensitivity and excellent signal-to-noise ratio. It combines modern large diaphragm capsule technology with the typical full-bodied sound of valve (vacuum tube) microphones that are preferred by vocalists and soloists. 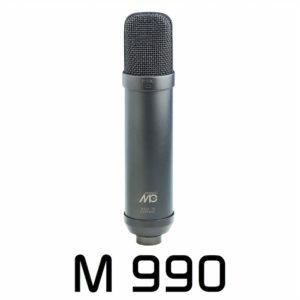 The M 990 valve capacitor microphone is well-suited for difficult radio play productions as well as a supporting microphone for orchestral recordings. The new pressure gradient transducer of the M 990 uses a large diameter gold-plated plastic diaphragm. The valve (vacuum tube) pre-amplifier is equipped with a pentode working as a triode selected for its sonic characteristics. The N 920.1 power supply provides the operating voltage for the capacitor microphone. It can be powered from AC mains with a primary voltage of 115 or 230 volts / 50 or 60 Hz. For cable lengths over 50 meters it is recommended to have your service provider set the heater voltage of the power supply to 5.8 volts. The N 920.1 is equipped with an on/off-switch, a 7-pin Tuchel connector that powers the microphone and a 3-pin XLR connector with integrated line voltage selector. The M 990 is packed in a wooden case and comes with power supply , connection cable C 92.1 and elastic suspension EA 92.